Promising merry memories and adorable photos, this soft fleece personalized baby Christmas hat & bib set includes matching holiday bib, personalized for your little “elf”! The baby Christmas hat has a back hook-and-loop closure (12″ high x 6″ diameter.). 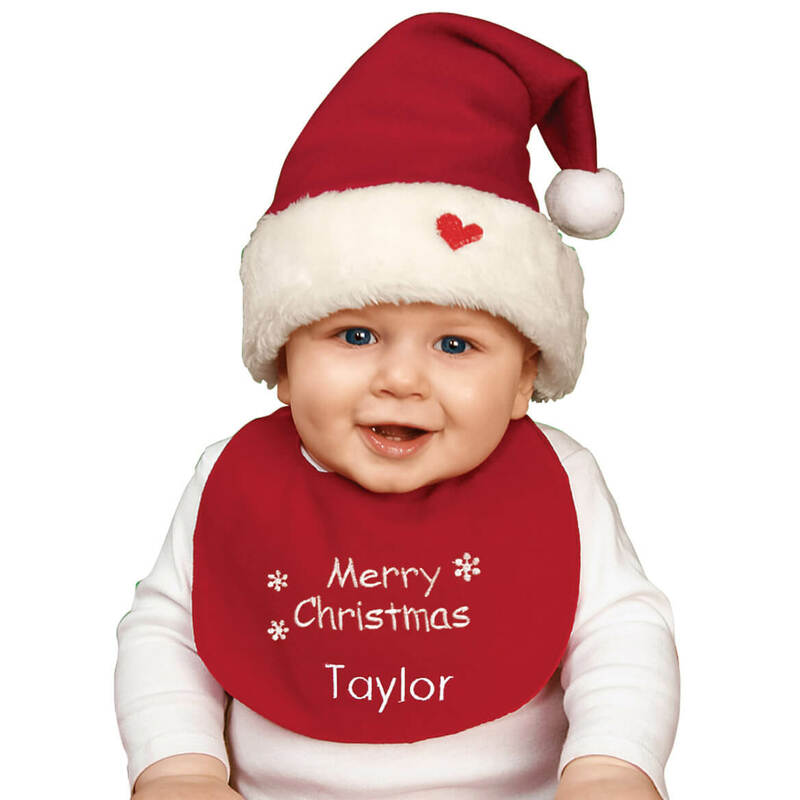 The baby Christmas bib features “Merry Christmas,” and your child’s name (8 1/2″ long x 9″ high). Specify name; limit 1 line, 12 letters/spaces. Polyester/nylon; hand wash. Imported. These cozy personalized First Christmas long johns let everyone know who’s celebrating a very merry first … no ifs ands or diaper butts about it! Keeping Baby comfy in ultra soft fleece, the one-piece long john pajamas feature snaps down the front and along the legs for quick, easy changes. We’ll embroider with Baby’s name for personalized style at no extra charge. Specify name; limit 1 line, 12 letters/spaces (Note: ‘s is standard). Specify size: 3, 6, 9 or 12 months. Kids long johns made with 100% polyester; machine wash. Imported. Great for long winter naps, sittin’ on laps and snugglin’ with Grandma … our fleece personalized Snowflake baby sleeper will be made just for one little darling! Adorned with snowflakes front and back, the ultrasoft kids’ long johns offers full coverage and quick diaper changing … snapping all the way down to warm, built-in footies. We’ll add Baby’s name in back for added fun. Specify name; limit 1 line, 8 letters/spaces. Specify size: 3, 6, 9 or 12 months. Christmas long johns made with 60% cotton/40% polyester; machine wash. Imported. Add sleek seasonal style without bulk. Our seasonal dickies add a layered look under shirts and sweaters but without the extra warmth. 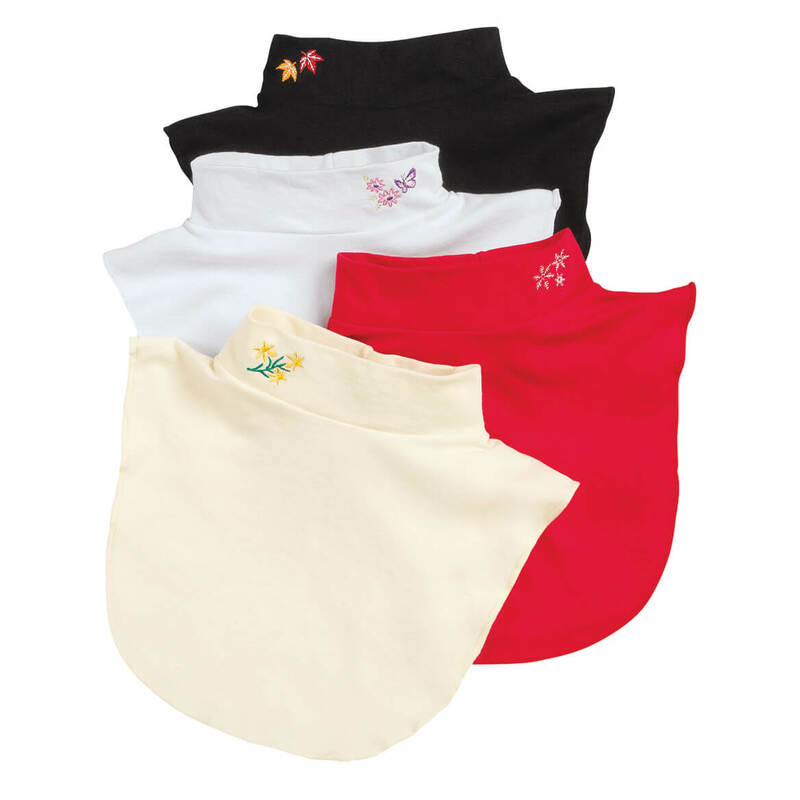 Set of 4 sweater dickies includes an array of colors perfect for year-round accessorizing: red with snowflakes, white with a flower and butterfly, black with leaves, and cream with flowers. Each bibbed design is 12″ long x 14 1/2″ wide. One size fits all. 80% polyester/20% cotton. Machine wash. Imported.